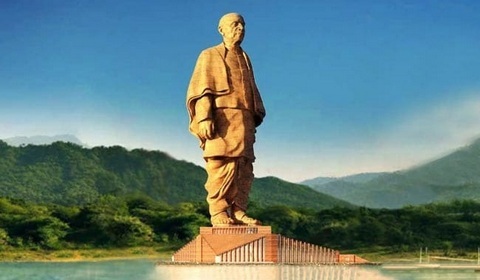 Statue of Unity will be lost the title of the highest statue in three years! Prime Minister Narendra Modi has unveiled his 182 meter high statue on Sardar Vallabhbhai Patel's 143th birth anniversary. 'Statue of Unity', the world's tallest statue made in Kevadia of Gujarat, has been prepared in record time. This statue is a symbol of the solidarity of the motherland. You can imagine the height of its height that this statue is twice the height of the Statue of Liberty. 'Statue of Unity' has been built on the Sadhu Island near the Sardar Sarovar dam in Narmada district. Today, the title of the Statue of Unity, the world's tallest statue, can remain for the next three years. After this, another statue created in India will break this record and become the world's tallest statue. It has been built by the Gujarat government, on the other hand, the Maharashtra government is constructing Chhatrapati Shivaji Maharaj Memorial with the help of about Rs.3800 crores. So far, the cost of construction of Statue of Unity has reached the cost of Rs 2300 crore. Though it is being said that the cost can reach up to Rs 3,000 crore. Larsen & Toubro (L & T) got the contract to create Statue of Unity and Chhatrapati Shivaji Maharaj Memorial. Chhatrapati Shivaji Maharaj Memorial or Shiva Memorial, being built inside the Arabian Sea in Mumbai, will soon get the title of world's highest statue. The height of the Shiva monument is 190 meters, while the Statue of Unity is 182 meters high. According to our website, the president of Shiva Smarak Committee, Vinayak Mete has said that Shiva's statue will be the highest in the world. However, the height of the Statue of Unity will be higher when the base is added. Apart from this, the Statue of Unity is a direct statue of Sardar Patel, while the statue of Shiva memorial has also been added to the height of horse and sword. Apart from Shivaji statue in Shiva Memorial, there will also be a museum, a theater and a hospital. According to the planned plan, this monument will be ready in 2021. In this way, the Statue of Unity will have the title of being the world's tallest statue of only three years. However, some environmentalists have objected to the design of the Shiva monument, and only after the completion of this project will one decide who gets the title of the highest statue in the world. And those titles want to be met, there is no doubt that India will be proud of these two monuments.